Something Brewing at Dr. Kombucha? The maker of kombucha beverages, is facing a potential consumer fraud class action lawsuit over allegations it overstates the benefits of its fermented teas, specifically the amount of colony forming bacteria in each bottle. Consumers allege they’re being duped because they buy kombucha drinks for their probiotic content in particular, according to the lawsuit. Filed by plaintiff Vladislav Bazer, the complaint states that rather than containing billions of probiotic bacteria in every bottle of tea, tests have shown that there are as few as 50,000 colony forming units, which measure the number of viable bacteria cells in a sample. According to the complaint, independent laboratory testing has revealed that the drinks contain probiotic bacteria in amount that is 20,000 times less than advertised. “Defendant regularly sells kombucha drink products that feature false and inaccurate representations about their probiotic content that do not correspond to the actual amount of probiotics in the product,” the lawsuit states. The complaint cites information from the International Scientific Association for Probiotics and Prebiotics and the Canadian Food Inspection Agency, which state that in order to make claims concerning the benefits of probiotics, products should have at least 1 billion colony forming units. 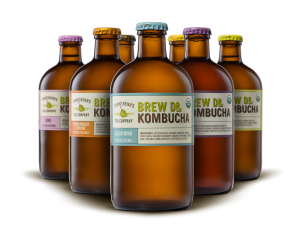 “Accordingly, it is not surprising that defendant’s ‘Brew Dr. Kombucha’ brand of kombucha drinks specifically advertise on their product labeling that each bottle contains ‘billions of probiotic bacteria, beneficial yeasts and organic acids,’” the lawsuit states. Bazer claims he would not have bought the products or he would have paid less for them had he known their true probiotic contents. Bazer seeks to represent a class of people nationwide who have purchased one of the company’s kombucha drinks as well as a subclass of people who have purchased one of the drinks in Illinois during the past three years. The case is Vladislav Bazer v. Brew Dr. Kombucha LLC, case number 2018CH02943, in the Circuit Court of Cook County, Illinois. Not Pretty. Here’s a newcomer to the employment lawsuit roster. MAC Cosmetics. Yup. They got hit with a proposed nationwide employment class action lawsuit alleging the company deprives its employees working in department stores of legally entitled rest breaks. The proposed lawsuit also claims MAC fails to reimburse its employees for business expenses. Now that’s not very nice. According to named plaintiff Janet Monteon, she was entitled to two 10-minute rest breaks per eight-hour shift. However, she states in the complaint that she only got her second break after eight hours of work, and not at six hours, in violation of California labor law. Monteon worked as an hourly employee at several MAC makeup counters in Macy’s department stores across Los Angeles from September 2008 to December 2017. According to the MAC lawsuit, “Plaintiff was not authorized or provided a second rest period after the sixth hour of work, due to MAC’s written policy only to provide a second paid rest period after eight hours of work. Plaintiff therefore was entitled to rest period premiums for all shifts between six and eight hours of work, and did not receive any premiums.” The complaint states that the noncompliant shifts can be determined on a classwide basis using “simple accounting and analysis of timekeeping records and payroll records.” Monteon also claims those could be used not only to identify class members, but also to calculate what each employee is owed. According to the proposed lawsuit, the withheld rest breaks are the basis for wage statement and late payment claims. Workers were entitled to a premium for forfeiting their second rest break, she alleges. That meant their wage statements were inaccurate and that they are owed late-pay penalties on their still-unpaid premiums. Further, MAC allegedly required its counter employees to download a messaging service app called “Group Me,” that updated workers on company news and policy via their phones. Monteon alleges she was never given a company cell phone and wasn’t reimbursed for data usage on her personal device. The lawsuit seeks to represent a class of counter sales employees who have worked for MAC in California stores after February 28, 2014. Further, there is also a separation pay subclass for people who no longer work for the company and were subject to its rest break policy, a wage statement subclass for people who received inaccurate wage statements and a subclass that tacks on and Unfair Competition Law claim. Supermarket Settlement… You bet it’s all about the money! This week, it’s about $6.5 million—the final settlement that has received court approval, finally ending an unpaid overtime class action lawsuit pending against Price Chopper and Market 32 supermarkets. The lawsuit was filed in 2014 by a woman in Massachusetts who alleged the company unlawfully classified her and other department managers as team leaders exempt from federal overtime protections. In total, there are four named plaintiffs, and a class of similarly affected but unnamed Golub employees. Parent company, Schenectady-based Golub Corp., will fund the settlement. Although few details have been released on the settlement, the five named plaintiffs will each receive $10,000, in recognition of their efforts on behalf of the class. The final list of employees and ex-employees who make up the class consisted of 311 people who opted in and 1,144 putative class members. The amount of the payment will vary greatly depending whether the employee opted in or was just a putative class member; how many weeks they worked; and where they worked, because Connecticut, Massachusetts, New York and Pennsylvania each have different statutes of limitation and, in some cases, multiply penalties. Ok folks – that’s a wrap for this week. See you at the bar! !